Text by DavidnnPhotos by Leonard Fäustle (info@leonardfaustle.nl)nnCoffee. Some eggs. Some more coffee. Hours before sunrise, cycling to central station to grab the train, for an hour of snoozing. Strolling along Amsterdam canals in the crisp winter air, sipping another hot black coffee and starting to stop being asleep, clouds transforming in the morning sun to a fierce burnished bronze. Highline days are beautiful.nnI arrived at the Klimmuur Centraal Amsterdam (climbing centre) exactly at the agreed time, making me feel like I have started to either become more of an adult or more Dutch. Possibly both. Hmmmmm, worrisome on both counts.nnIn any case, Jonas arrived at the exact same time, Tom and Yuri a few minutes later. Conveniently, we were offered another coffee, which I greedily accepted, faking a yawn in the hopes of manipulating the barista into making that coffee extra strong. Much success was had with this method.nSo, after laying out the redtube and taping it together, organising the shackles (delicious van beest green pin), time to rig. Climbing behind the wall was an interesting experience, to say the least. 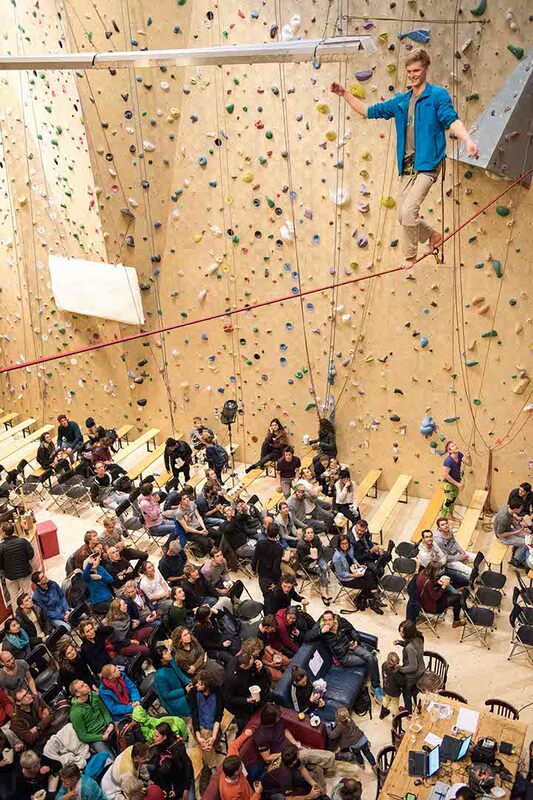 This route was certainly not designed for humans. Many contortions required and of course much, much dust. So much dust. 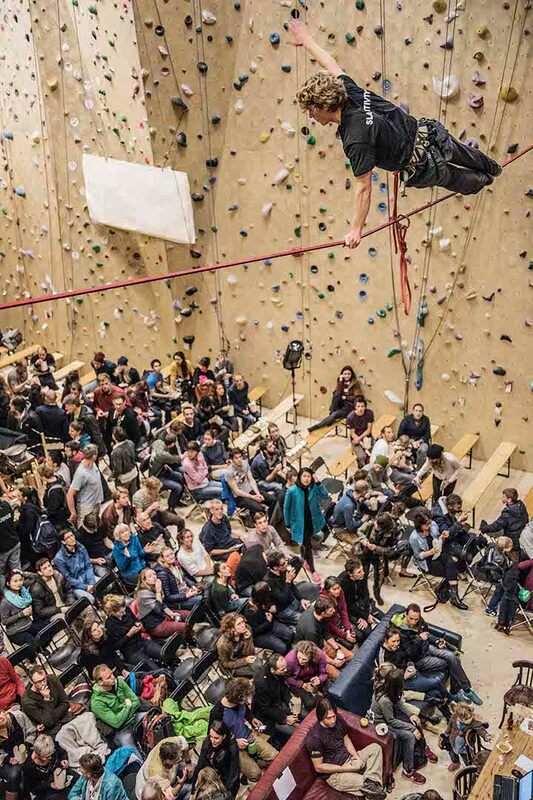 You know when you are at the climbing hall, all chalked up hands, you’re climbing and then go for the grab and hit the wall instead? That dust gotta go somewhere. And now it is still firmly lodged in all the pores of my skin. Forever. Then at least we got to walk across the roof to rig the other side, getting some awesome views of central Amsterdam, along with sweet fresh air.nnFinally, highline time. 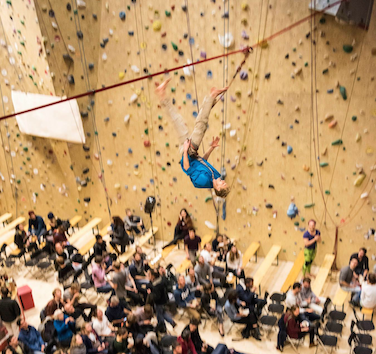 We all had a chance to highline a few times before the big show, which was really nice to play around, practice a few tricks and prepare to open the Dutch National Climbing Championships later that day, around 6pm.nnSurprisingly quickly, showtime rolled around. I climbed up to tie in, and got the crowds attention by sliding quickly across the line on my hangover, definitely surprised them. Now it was time for time for Tom to open the show.nnTom tied in on the other side, went straight to the middle for extra double smooth power and slipped straight into a double knee drop exposure. He stood up into exposure, looking the hundreds of people in the eye (well, he only looked about 15 in the eye). Then his legs started to slide apart, ah nooo! But it is ok loyal readers, he was punching an exposure splits in its metaphorical and actual face. Much goodness. Time to pop the show stopper, he got a good firm grip on that redtube and front levered, legs higher than his head. Much power, much love from the crowd. Tom got up and moonwalked (by moonwalk I mean walked backwards, but you get the idea) back to the wall.nnNow it was my turn. Damn. They were probably expecting me to do a flip and breath fire from my hands. I decided instead to surprise them even more. I walked to the middle of the line, stood in exposure, then squatted down. I touched my index fingers to my thumbs and put my hands on my face, and yelled “hoot hoot”, which certainly surprised the crowd!. Yes, I made an owl on the highline, to hundreds of people (interesting sidenote: owl in dutch translates as onion bird). I then stood up (totally didn’t nearly fall and embarrass myself) and then proceeded to stand on one leg, bend my standing leg and put my foot up on my leg, hands together in front of me. Yoga highlining (my version, anyways)! Time for a quick surf, I then turned around and quickly walked back to the wall and quickly got down.nnYuri stood up. Instead of simply walking out, he bounce walked his way out to the middle. Once there, he immediately focused the crowd, by standing in exposure, turning towards the crowd and lowering his arms. It looks very easy, but it is much more difficult to actually do. He needed to finish his performance, in style and quickly. 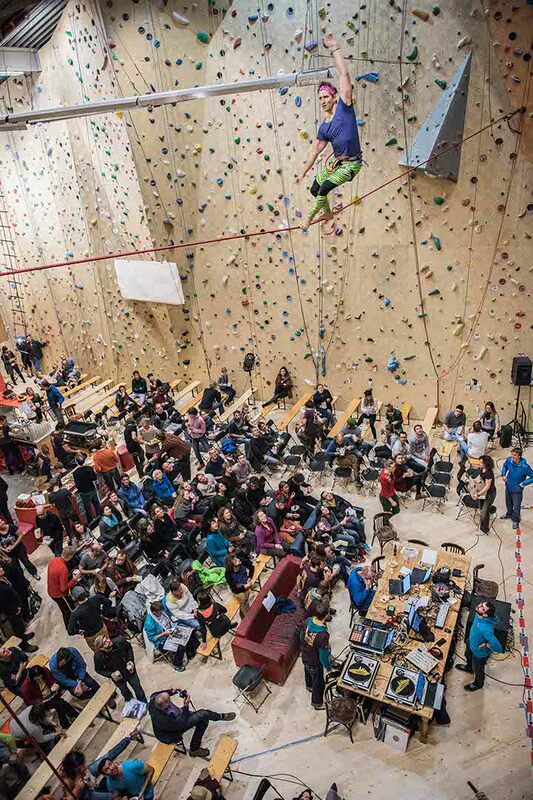 The route setter had started to climb and get the holds ready for the womens climbing finals. So Yuri gave the crowd a salute, leapt forward very suddenly! The fall really grabbed their attention! He got quickly up and walked quickly to the wall, to allow Jonas to close the show!nnJonas. He walked very cleanly out to the centre of the line, but he was feeling the pressure to perform and perform quickly. A typical Jonas decision to let off the steam: he made a huge jump and leashfall, quickly monkeying back up the leash. Now for some acro shizzle. Starting with a side plank, which is incredibly difficult, he then hung from the line from just his toes. After this, his reached up for the line and keeping a firm grip, he rotated his legs and feet over his head, continuing to hold the line. 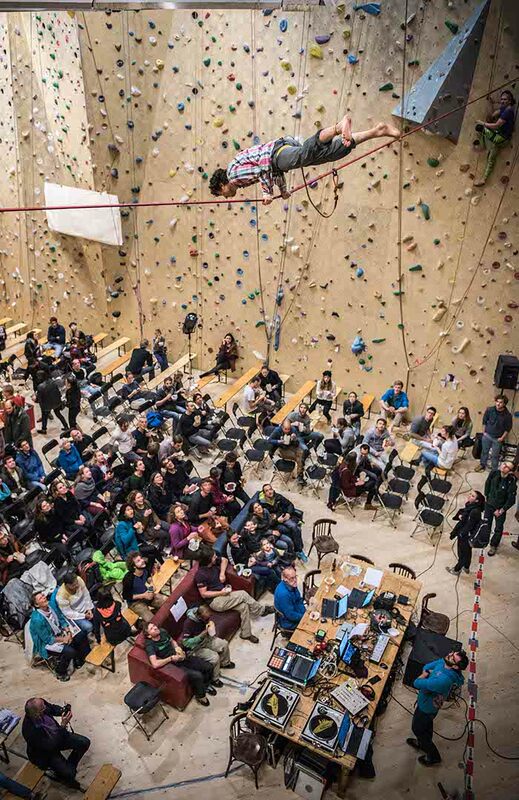 The clock was really ticking; the route setter for the climbing championship was completely ready and already roped in, waiting for us to finish. Jonas stood up, waved to the crowd and headed back. A great finish to the show and we now needed to pack up, QUICKLY!nnIt was up to me to get to the roof, climb across, getting down into the wall on the other side. I realized as soon as I started to crawl through the very tight gaps, that I forgot a torch. Too late to go back. But, actually quite nice, with the light streaming through the holes in the climbing wall, dust particles entering every orifice of my body, driving me insane. Lovely. We had some minor difficulties with derigging and managed to get the line down just as the route bolter finished with the womens route. Moments later the live stream started and shortly after they were climbing!nnAnother excellent demonstration given, we all learnt much and can’t wait for the next event! Thanks to Slacktivity, SO SOLID and Van Beest for gear and support!